Today is the last day of Doors Open Niagara. Saturday, October 19 ~ 12 Noon – 4:00 p.m.
Sunday, October 20 ~ 11:30 a.m. – 3:30 p.m.
“Under This Roof” restoration fund. Blessed Trinity is once again a featured site for the bi-national tourism event, Doors Open Niagara. 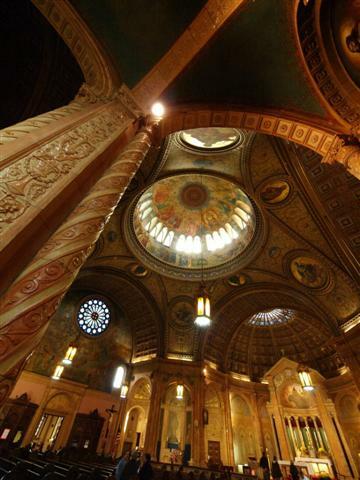 The church, which was built between 1923 and 1928, is recognized as an “extraordinary re-creation” of 12th century Lombard Romanesque-style architecture. It will be open for free guided tours on Saturday, October 19, from Noon – 4 p.m. and on Sunday, October 20, from 11:30 a.m. – 3:30 p.m. Docents will be on hand to describe the church’s architectural features and interpret its artworks and selected iconography. There will also be informational handouts, a historical display area, and sales table. Visitors are encouraged to bring binoculars and cameras. The first Doors Open Day took place in France in 1984. Since this program was launched in 2002, nearly 5 million visits have been made to participating heritage sites. To learn about other 2013 Western New York sites, Click HERE. Doors Open always has always included a photography contest, and Blessed Trinity has been a favorite subject with contest participants. This year’s entries must be digital, and you can find complete contest details by Clicking HERE. Blessed Trinity’s open house hours have been conveniently scheduled before and after our weekend services. Please consider joining us for worship at 4:30 p.m. on Saturday or 10:00 a.m. on Sunday.